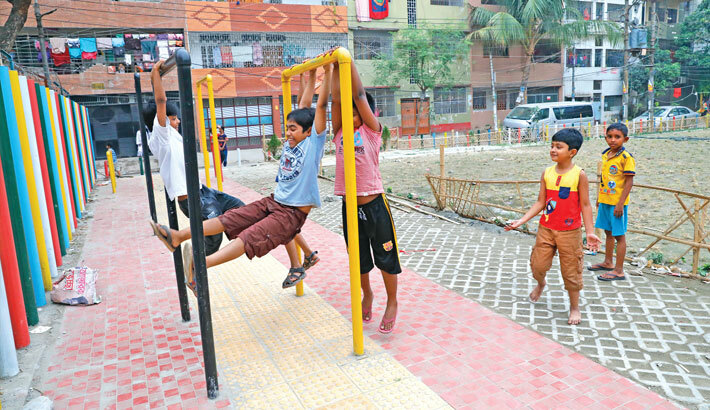 Dhaka North City Corporation has started modernising 26 parks and playgrounds under its jurisdiction to make the recreation centres more suitable for public use. DNCC has undertaken the project as most of the parks and playgrounds in its area are in poor state, losing their appeal to city people. The government will give around Tk 280 crore for the project while DNCC will spend Tk 3 crore from its own fund. DNCC has already started renovation works of three parks and playgrounds. Tender process of some others has been completed. The project is expected to be finished by June 2020. “Many parks have boundaries. We want to remove these to let people move freely in open space without any hurdle,” he added. He said when the project will be implemented, increased green and renovated open space will help children grow in a healthier environment in the capital. The parks which will be brought under the project include Tajmahal Road Park, Lalmatia D Block Park, Humayun Road Park, Mohammadpur Town Hall Shaheed Park, Shyamoli Park, Mirpur Gudaraghat Park, Farmgate Trikon Park, Shia Mosque Park, Iqbal Road Field Park, Karwan Bazar Shishu Park, Nayatola Shishu Park, Sher Shah Suri Road Park, Gulshan Park, Banani Park and Uttara Park. Apart from these, the Eidgah field will be renovated in front of the Taj Mahal Road and Mirpur Zoo. Currently, there are 50 parks and playgrounds in the capital. Of them, DNCC has 22 parks and four playgrounds in its area. Under this modernisation project, DNCC is also recovering park land and playground from encroachers. According to DNNC officials, arrangements will be made for people of all ages in these recreation centres. There will be no boundary walls, so people can move freely. There will be restrooms surrounded by greenery. Separate lanes for cyclists and gymnasium will be built for exercise. The development plan includes eviction of encroachers from park land and playground, planting more trees in parks, making modern drainage system, installation of improved toilets and making arrangement for safe drinking water, they said. Apart from walking-tracks for elderly people, playground for children and youths and separate resting place for women will be built. There will be a canteen next to a park or playground for snacks, said the officials. There will be separate entertainment facilities, including sports for adults. Adequate lighting will be provided inside the park for smooth journey in the evening, they said. A sufficient number of security personnel will be kept in every park and playground, they added. Separate arrangements will be made for physically-challenged people in parks and playgrounds. After the renovation, maintenance initiatives will be taken with the help of local elites, the officials concluded.